What I'm Learning — Ginger writes. I learned this week that the correct way to pronounce A.A. Milne's last name is to say a one-syllable word rhyming with kiln. I was giving it two syllables until two days ago. What Audible books to consider (and at reasonable prices): Thank you very much, Read Aloud Revival! I met Megan at Tandem last week to talk about Audible among other things. Discussion of the ideas in Cindy Rollins's Mere Motherhood was important work over crepes and coffee. I went to our meeting needing encouragement and inspiration from the heart of another mom walking this same road of University Model Schooling, and the Lord provided. Megan's giftedness at taking the longer view, coupled with her ability to articulate a vision for what we desire our children to learn and become, appeals to my heart and mind. I am pushed toward greater intentionality and thought when I spend time with people like Megan and the writers/thinkers who have inspired her. These past two weeks have been for me a time of renewed interest and searching for truth as it pertains to the heart of educating our children. In the learning and revisiting of ideas, I am being inspired in both our home school and our home life by these recent reads. 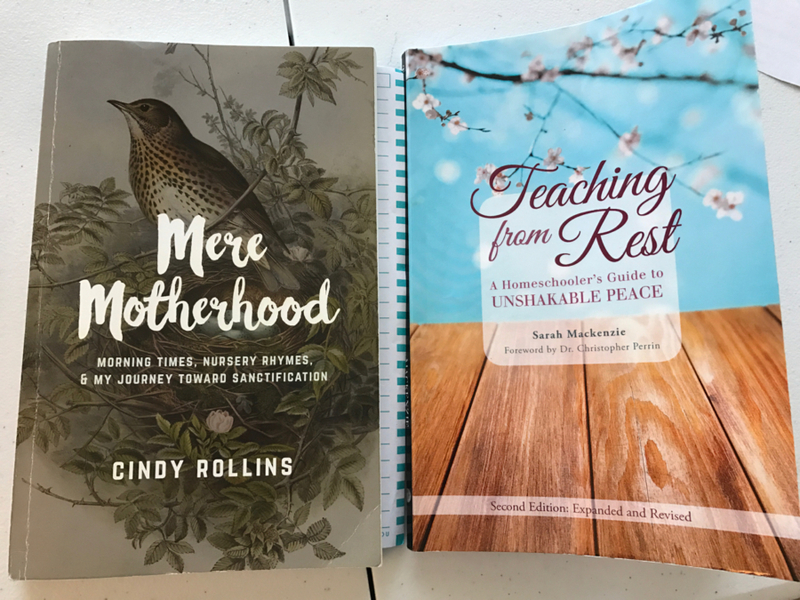 I read Mere Motherhood for the first time, and Teaching from Rest for the second. Challenging and inspiring quotes abound in both. Oh wait, I better just not get started on the quotes. I began flipping back through Mere Motherhood to read my underlines and all I can say is, if you even think you have an interest in home education, Go buy this book. Rollins's writing entertained me in a lighthearted and fun way, yet at the same time it carried weighty and timely words in consideration of how we nurture our children's hearts and minds over the long haul. I have now moved on to reading Karen Glass's Consider This, and next on my list is The Hidden Art of Homemaking by Edith Schaeffer. And lest you misunderstand, my life allows barely any time for reading right now, but a few pages night after night adds up to something much greater than the sum of all those ten minute blocks. As Rollins says, "You are never going to have a lot of time, but you do have a little time here and a little time there, and those little times all add up to a life." What a gift that we can keep learning and becoming, and that words are the trusty vehicle by which this progress begins. Another gift from Mere Motherhood was the mention of a number of poems Rollins had her kids learn as a part of their Morning Time routine. 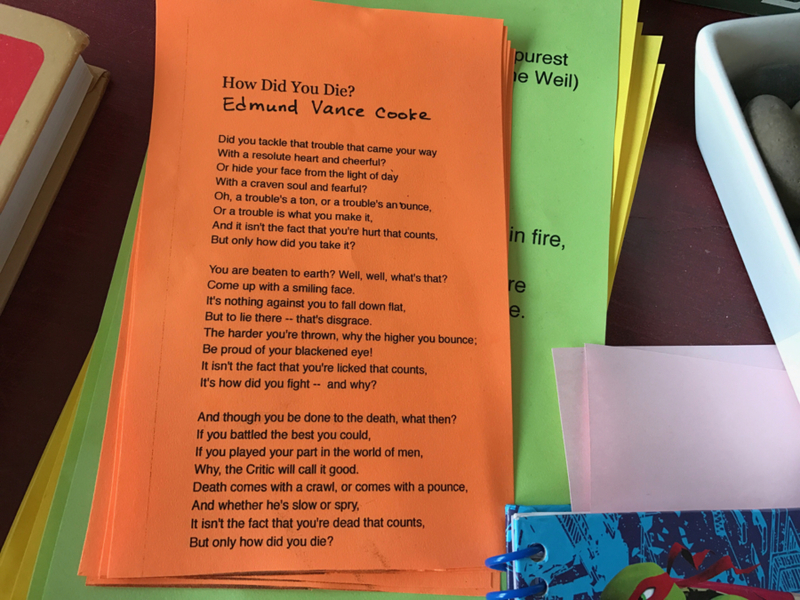 I googled each poem and chose "How Did You Die?" by Edmund Vance Cooke as our new poem for memory work and memory play at dinnertime. That we can put more, more, more of the good stuff in our minds and hearts day after day, that little bits of this and that add up to lives of goodness and beauty and honor, these are my lessons of late. Wow, what a life to live! And what a God behind it! My heart is full this day when I hear Story recite "Vespers" by A.A. Milne, before we move a few lines farther into our memorization of "Puppy and I. "Bauer asks me, as I'm cooking dinner, if he can say the whole thing (already!) of "How Did You Die?," while the rest of us are still on the second stanza. Cash says "Wynken, Blynken, and Nod" with a cheerful spirit and without missing a beat, and Sailor clamors for her own copy of the poem printout at dinner. I don't have it all figured out, but it feels as if I've struck gold to get this opportunity day after day to inspire and be inspired.